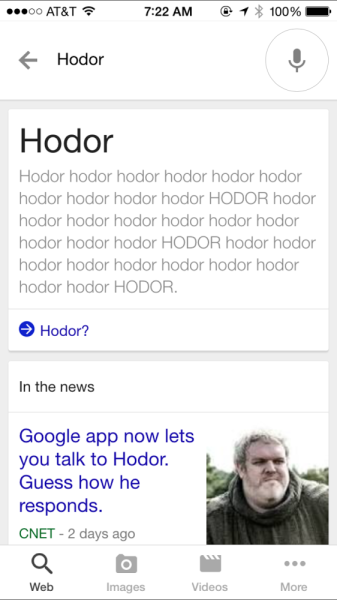 New Google Easter Egg Responds to Hodor! Hodor is a character from the ubiquitously popular book series A Song of Ice and Fire and TV series A Game Of Thrones. Hodor is a character who, much like a Pokemon, can only say Hodor. Everyone refers to Hodor as Hodor, even though his actual name is Walder. Are you a fan of this new Easter Egg from Google? For all you web developers out there, here’s a bonus Hodor Ipsum Generator.